A rare piece of Royal history was offered today at auction at Gildings Auctioneers of Market Harborough, with a rare letter from the late Diana, Princess of Wales, to her bodyguard written just a month before her tragic death sold for £2,950. 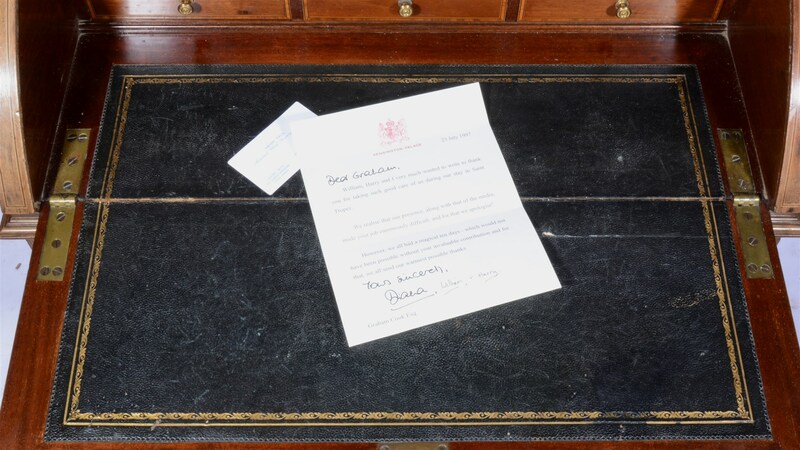 The thank you note on Kensington Palace headed note paper, addressed to Graham Cook Esq, was further signed by the young Princes William and Harry, making this very personal acknowledgement an even rarer piece of late 20th century history. In the summer of 1997, Diana, Princess of Wales, was attracting media headlines around the world with her newly formed relationship with Dodi Fayed, son of the Egyptian-born business mogul Mohamed Al-Fayed. In July of that year, Diana accepted a personal invitation from Al-Fayed to stay at his family’s summer compound in St Tropez, Southern France, with her two sons. The Royal family members were to be looked after by the Al-Fayed’s personal protection team whilst there, headed up by Henri Paul, and including the letter’s recipient, Graham Cook. On return to Kensington Palace, on 23rd July, Diana dispatched a personal thank you to Cook for his services. A little over a month later, the World awoke to the tragic news of the death of Diana, Dodi Fayed, and Henri Paul, following a stay in Paris’ Hotel Ritz.